Exhibiting Artwork. Part of Being an Artist. Is there a way to try a class out before signing up? 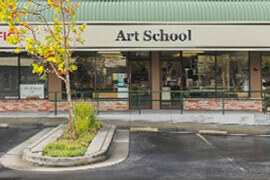 We offer monthly free introductory lessons at each of our studios. Kids will experience a typical one-hour class during which they will complete an art project with an instructor while parents attend an orientation session with the studio manager to better understand our philosophy and approach. 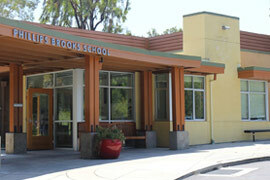 You can assure your child that they will be grouped with peers who are also new to Marvegos. Please check out our schedule and register for the free introductory lesson here. How do I register my child online with the new system? First, click on the LOGIN/REGISTER link in the navigation bar above. 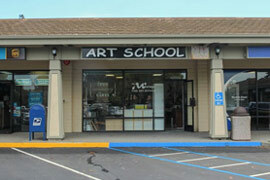 It will take you to a list of available classes and programs. Use the filters on the left side of the page to refine the search for classes suited to your child. Once you select a class you will be asked to fill out all the requisite information to become a Marvegos family. We accept both Visa and Mastercard payment. Is it possible to register a student mid-session? Mid-session registration is possible depending upon availability within the class, the type of class and when art projects have commenced. You should contact the Studio Manager for your location directly to determine what’s possible and, most importantly, what’s best for your child. Do students need prior art training to enroll in the Advanced Exploration program? It is not necessary for students to have prior art training to begin our Advanced Exploration program. Our small classes and individualized teaching approach allow us to base our program on personal level of developmental rather than level of art training. Are there additional fees for supplies? There are no additional fees for supplies. All supplies are provided and are included in our fees. Do you have discounts for siblings? 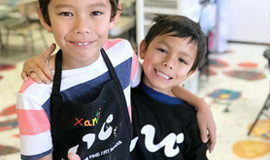 Sibling rates are available for our school year studio programs ONLY. The sibling rate applies to all siblings attending simultaneous sessions. Sibling rates are NOT offered for outreach, homeschool, summer or break programs. What is the student-teacher ratio of Marvegos® programs? Most of our programs have a student-teacher ratio of seven students or fewer per instructor. Much depends on the composition of the group of children. Instructors have the flexibility to ask for fewer students for a class, if the composition of a group requires it. 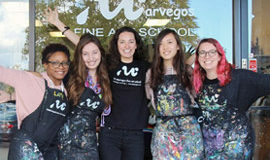 What are the qualifications of The Marvegos® instructors to teach art? 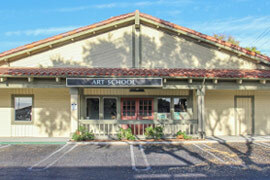 All Marvegos® instructors are artists with a college degree in fine art. A strong portfolio of work weighs greatly in our selection process. Instructors must also embody qualities that respect the ideas of children and have the ability to communicate with children as well as adults. What does The Marvegos® mean? Our founder, Rita Young, wanted a name that represented the essence of what making art could bring to children. When artists look to the world around them for ideas to draw or paint, there’s a marveling of nature and experiences that happens. It is the ego, the self, that marvels at life and translates the ideas into art through creative expression. 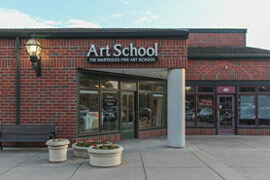 The Marvegos® Fine Art School is a place where marveling and acceptance of self is nurtured. A place where ‘marvelous egos’ grow their creative selves. When are students ready to begin The Marvegos® program? Successful art-making experiences foster interest in the creative process and self-confidence in children. The Marvegos believes readiness is, therefore, a critical consideration in deciding when to start any program designed for children. The Marvegos criteria for readiness for our programs is when children are able to use scissors and do more than make circles when they draw. Most children are able by 4 ½ years old to perform these tasks. We are confident that the program we designed to provide art for preschoolers will be one they enjoy. Preschoolers who are ready for our program are a joy to watch because they are fully capable of exercising their own creativity and do so in the most enchanting way. Are the materials used at The Marvegos® studio safe for children? All the materials used by students are labeled non-toxic or are household items, with the exception of clay. Silicates in clay are considered harmful with extended use. 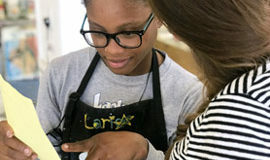 Over the course of the school year, students will create four ceramic pieces. This usage is considered minimal. Parents may opt for drawing instead of clay on clay days, which is the first class of every session. Drawing medium such as charcoal and chalk pastels create dust. Parents of children susceptible to respiratory conditions should remind the instructor on the day of a drawing project to provide a dust mask. You may also bring your own mask to class on drawing days. All other precautionary warnings about usage of products, are heeded and worked into our process. Fine Art Fundamentals and Advanced Exploration students may ask for homework, which we call Sketching for Fun assignments. These assignments are optional. Obvious rewards come from additional practice away from the studio. 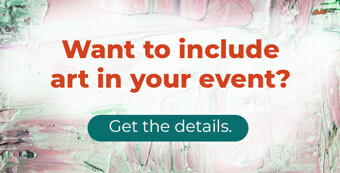 Students may receive up to 4 points per week/drawing for completing assignments. Your Marvegos® instructor will sign off on assignments and will use the assignments to further guide your child’s progress. Trips to art museums (not galleries) also qualify for points. Parents/Guardians need to sign off on the assignment sheet for art museum trips attended in order for your student to receive credit. Students receive a $5 gift card for every 28 points earned. Points carry over from school year to school year as long as parents let us know in advance that their student will be returning. A hardbound sketchbook for Sketching for Fun assignments is desirable and may be purchased from The Marvegos®. Will aprons or smocks be provided to protect our child’s clothing? We want students to feel free to make art unencumbered by concern for their clothes. Students often come in ‘art clothes’ and our studios have aprons for communal use. If you purchase a personalized apron from us or bring your own smock, please take your aprons/smocks home and bring to class each time. The Marvegos® is not responsible for damage to clothing.